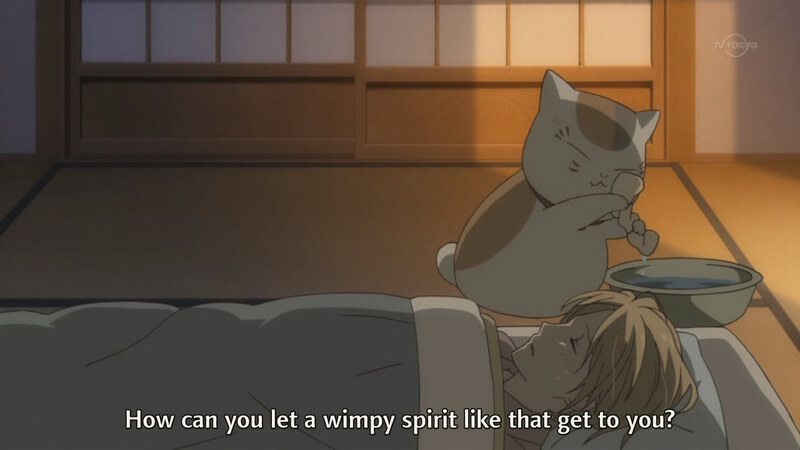 This final batch completed the third season of the Natsume Yuujinchou series, much to my chagrin. I wish there was more... Ep11 finished the arc about Tanuma being possessed, ending with a stronger friendship between him and Natsume. 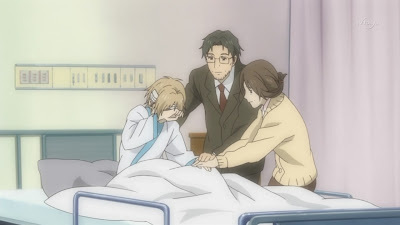 Ep12, meanwhile, saw Natsume under the weather due to a demon's attack, and a lengthy flashback from his past (that directly led into how he came to live with Touko and Shigeru). 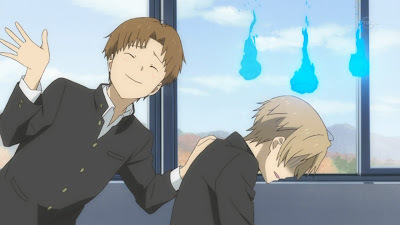 Ep13, to finish off the series, was the most feel-good one of the batch, focusing not only on Natsume's group of human friends but also his amassed group of spirit friends. Damn, that cat has a lot of strength. Ep11 picked up with a voiceover from Natsume, reminding viewers of the situation from ep10. Given that the priest was once again away on business, Natsume stayed over at the shrine in order to watch over Tanuma. 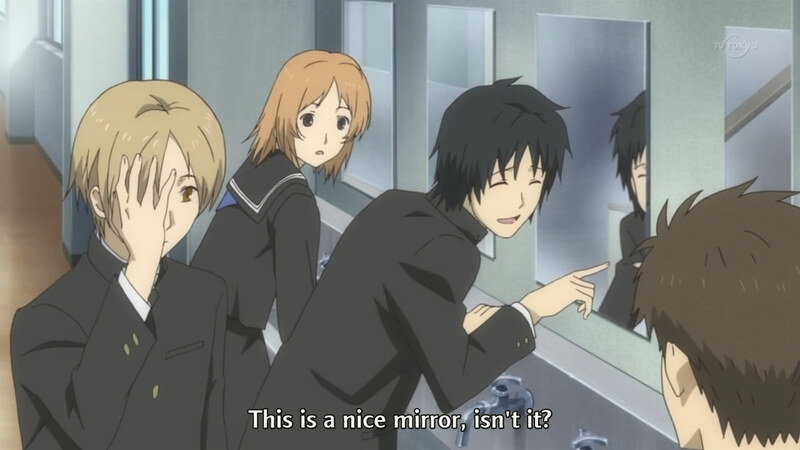 A major plot point of the episode was the fact that Tanuma really didn't know the extent of Natsume's powers, especially in his day-to-day events. When granted the ability to see through the demon's eyes, Tanuma was quite surprised with what Natsume could see on a regular basis. It really drove home the fact that there's a huge communication gap between Natsume and any other character, something the viewer rarely sees considering we get a generally unlimited perspective. 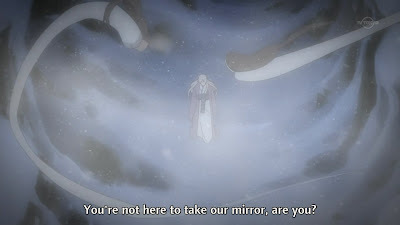 The useless demons were unable to actually protect their mirror. How weird. Due to Natsume's helpful ability to spy on nearby spirits' and demons' dreams, there was a pretty detailed back story for the demon possessing Tanuma. She had gone on an epic search for a special mirror after her friend unexpectedly left her, having come down with a serious illness that would have spread to her if he stayed. The mirror, of course, was the only thing that had any chance of healing him. This sense of loneliness allowed her to tell Natsume that it wasn't right he wasn't communicating more with Tanuma, which was the little bit of catalyst needed to further their friendship. Another day of weird scenes! The cat has opposable thumbs! Ep12 began with Natsume having lunch with Kitamoto and Nishimura, who talked about how he was so well-adjusted despite having moved around so much in the past. He spoke about still making mistakes, such as not letting Touko make his lunch in the past since he didn't want to be a bother. 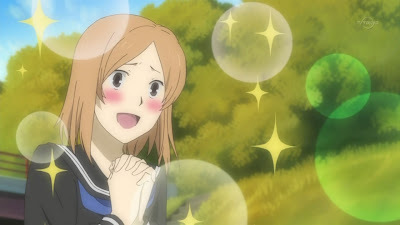 He had learned to let her make it because she wanted to hear from him that her cooking was good, which led directly into the main plot point of the episode: Natsume's past. When he got home, a demon attacked him (which ran away the moment Nyanko-sensei appeared); this caused Natsume to fall into a deep fever, which greatly worried both Touko and Nyanko-sensei. That's actually a pretty scary face, as far as demons go. It turned out that the demon was actually one from a long time ago, just before Natsume came to live with Touko and Shigeru. It took an interest in him due to his loneliness and heavy heart, wanting to take him along (to eat? to keep as a pet?). While Natsume was scared and confused, he didn't particularly feel the stress until he had something to protect - his future with Touko and Shigeru. Touko had come to visit him and, after leaving without saying anything at the first meeting, she sought him out for a second meeting in order to offer the option of coming to leave with her. 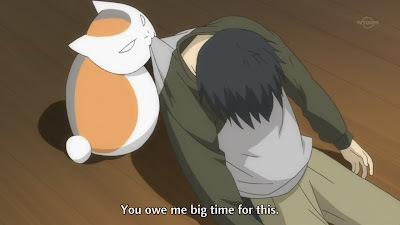 This being the first time that someone had actually wanted Natsume, he was overcome with emotion and found it within him to confront this demon. The family looks so cute together. Honestly speaking, it was the scene of Natsume coming into his own and luring the one-eyed demon into the trap that reminded me of just how much I love this anime. I was overcome with emotion after seeing the transformation that occurred after he had just one person telling him that he was wanted, and seeing his newly-summoned courage in action. 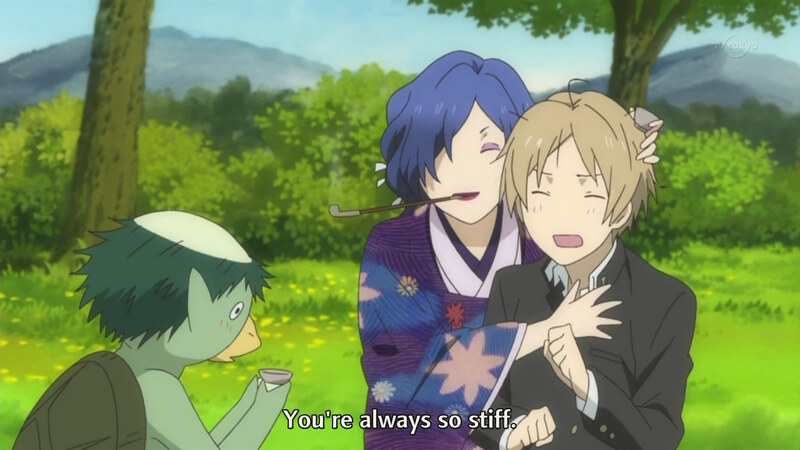 It was nice to see within this episode that not all of his family before Touko and Shigeru were terrible; the son of the couple he was staying with was sympathetic that his parents didn't behave very lovingly with Natsume. It's not like he did anything about it, which might just make him as bad as his parents, but that's not my point. It's too easy to point fingers; I just wanted to see at least some semblance of understanding and it was there. 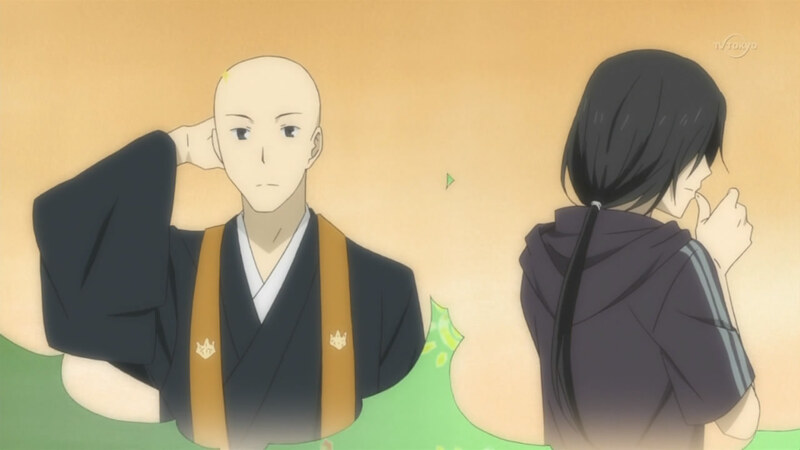 Why does Grown-Up Natsume have a dark hair colour? 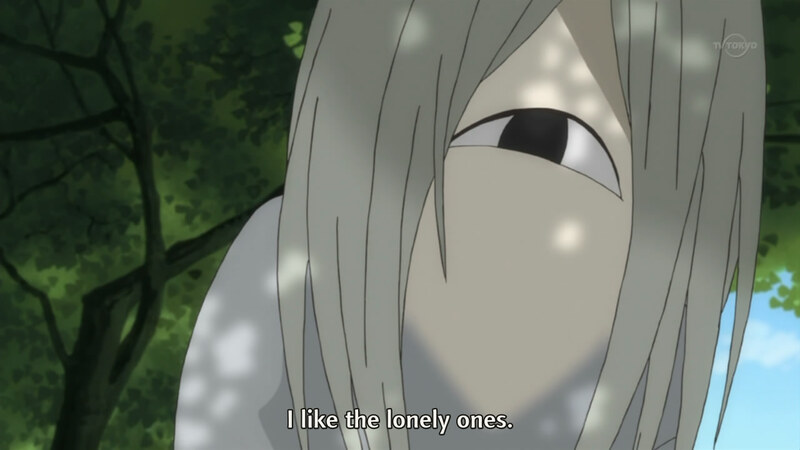 Ep13, the final episode of this series, was a look at Natsume's current life. His friends - Kitamoto, Nishimura, Sasada and Tanuma - were planning an outing after the end of midterms, while also talking about the changes that both Natsume and Tanuma had gone through since their arrival as the quiet and stoic new transfers. When the conversation turned to their futures and what to do after high school, I was interested in hearing that there was no question in Natsume's mind that he would be staying with Touko and Shigeru even after becoming an adult. That really signified that not only was he accepted, but that he had also accepted his place. There was never any resolution to where the friends decided to go, after Natsume said that anywhere was fine because they would all be together. The remainder of the episode was focused on the spirits around Natsume, who had decided to hold a party in his honour on the night of the Spirit Moon, when sake tasted a lot better. While Natsume didn't particularly want to go, he was roped in (quite literally, after falling into a trap set by a rope-wielding spirit) and thus began the party. The spirits found the game of Shadow Tag incredibly amusing, and Natsume reminisced about how it was his first time playing it (when he was younger, he used to just watch the neighbourhood children playing). When his human friends came calling, Nyanko-sensei advised him to head off, giving a lot of meaning to the ending (that he had a foot in both worlds, and was able to devote time to both sides). With the series closing for this season, I do immediately feel sad. I was struggling for the last few days in order to determine my actual rating for this anime; with just one good scene like the one in ep12, I easily remembered just how much I love this.